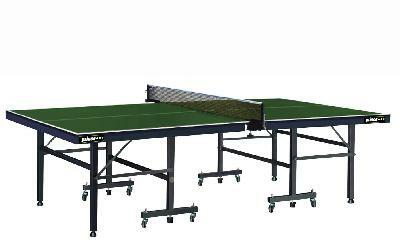 The Prince Ace PT1300 Table Tennis Table is strong, durable, and quick and lively to play on. The .75-inch-thick MDF play surface is finished in classic green and divided in half for easy folding and tight, bouncy performance. It's surrounded by a 1.5-inch apron and supported by a square leg frame and 8 swiveling rubber wheels. You can fold one half up for one-player practice, or both for easy roll-away storage. Net and post set included.